That’s the central question of Review, never more ominous than in “Murder, Magic 8 Ball, Procrastination.” A viewer wonders, “What would it be like to kill a person?” and the show takes a beat before revealing that finally Forrest MacNeil has been assigned a task he cannot countenance. Grant joins Forrest onstage to ask not once, not twice, but three times, “Are you certain you wish to veto this review?” Affirming thrice, Forrest breaks the glass case, unfurls a scroll, and declares the first veto enacted. A staff member scurries to destroy the scroll (and Forrest’s safety glasses). It’s a solemn proceeding, and a conspicuously ceremonious one. Is the ceremony meaningful? Concentrate and ask again. Sacrificing a veto to escape a randomly assigned task, Forrest is free to plunge into a day of randomly assigned tasks. “Living life by the Magic 8-Ball, that I will do! It might actually be fun.” Will it? Outlook not so good. Not wanting anyone “to think I’m weird,” he hides the fortune-telling novelty toy in a fanny pack, and spends the day jostling his groin while onlookers edge away. (Before our international readers bubble over with delight or shock or shocked delight, the word fanny doesn’t mean that over here; fanny pack is the equivalent of bum bag, and I’m just digging this hole deeper, aren’t I?) He delegates every decision to the Magic 8 Ball, asking whether to use the restroom (no), chase a squirrel (yes), or have a hot dog (no). He doesn’t even cross the street without permission. Forrest aims increasingly plaintive requests toward the vicinity of his crotch as it leads him from pleasure to dejection to terror. First, the Magic 8 Ball steers him “far outside the zip code where I feel most comfortable.” (Forrest knows all the zip codes!) Then it prevents him from answering Suzanne’s long-awaited call. When he’s finally permitted him to take her call, he can’t speak from the heart; instead, he delivers the 8 Ball’s vague negatives verbatim, alienating his ex-wife even more. Will this end badly? You may rely on it. Forrest both does and doesn’t steer his own ship. Surrendering choices to the Magic 8 Ball, his voiceover muses, “The more I embrace the randomness of life, the more meaningful even the smallest decisions seem to be.” Then the shot widens to show he’s asking to share his meal not with the homeless person in the background, but with the squirrel in his path. Forrest doesn’t see that even when he submits to the 8 Ball’s arbitrary yes or no answers, he’s still choosing the scope of his questions, and therefore deciding the sphere of action, if not the outcome. This cognitive dissonance is characteristic of Review. Forrest cannot or will not face his own complicity in the disasters around him, how his devotion to his self-appointed duty often puts catastrophe in motion, or the clash between his moral and familial obligations and his practical obligations. In this way, Forrest MacNeil is all of us, sometimes sacrificing our noble intentions to practical needs or selfish desires. Nowhere does that clash of responsibilities and morals become clearer than in the second request from Gina of Toluca Lake. Not sure if her first message was sent, she asks again: “What’s it like to kill a person?” Because he’s used both his vetoes (the second on a question he deemed logically impossible, “What’s it like to procrastinate?”), Forrest must honor her request or break with the principles of Review. It reflects well on Forrest, insofar as selecting a murder victim in cold blood can reflect well on a person, that he never considers murdering over personal grievances. He first visits the now-comatose victim of the alleyway beating, thinking a mercy-killing is “the least bad way to do this.” Ready to smother the stranger, his compassion and revulsion rise up, and he wails “I can’t do it! I can’t do it!” into the pillow he’s clutching. The moment is as devastating as it is inevitable. After nearly two seasons of sacrificing his body, his home, his family, and his conscience to Review, Forrest resolves to eschew his self-imposed duty to save a life—and to salvage his own humanity. And then he is forced to kill anyhow. Ray’s attack could read as a narrative cop-out, a pretext for Forrest to kill a man while retaining the audience’s sympathy, but the show carefully portrays the weight of the act on Forrest, no matter how necessary. More importantly, Review is as unblinking in its tacit examination of Forrest’s complex moral and practical culpability, and the impossibility of escaping blame in the maelstrom that is Review (“Just so you know, the guy in the coma died, too”), as Forrest is in his denial. If Forrest were capable of contemplating his own culpability, he wouldn’t be here in the first place. Gina doesn’t ask “What’s it like to commit murder?” She asks “What’s it like to kill a person?” Going into space with his father-in-law Jack (Fred Willard), Forrest failed to perform the buddy-system harness check, and Jack hurtled to the roof of the shuttle, snapping his neck as they slipped the surly bonds of earth. Forrest brought Mrs. Greenfield to California, brought her into his cult, brought her to camp in his father’s meadow, and—much more directly—his steroid-fueled rampage brought on the volley of gunfire that culminated in her death. Forrest knows what it’s like to be instrumental in the death of another… but he might not know he knows. Forrest’s rejection of responsibility runs deeper still. Concealing his murder weapon in the fanny pack is more than narrative neatness. In the world of Review, the Magic 8 Ball—and by extension, the randomness of Review itself—can become a tool of violence and mortality as surely as the gun does. Forrest’s more than willing to surrender to randomness; he’s comforted by it. He greets the assignment “as a relief,” praising “the iconic Magic 8 Ball with its mysterious triangle afloat in inky blue non-toxic realm” that has “provided advice and premonition to those adrift in the inky blue, often toxic waters of life.” Forrest doesn’t just comply with the unpredictable demands of Review. He yearns for the escape they offer from the burden of decisions. Even Forrest’s cry as he runs from his crime hints at his complicity: Another veto would have saved him from this request, but not from the next one, or the next one, or the next one. Only Forrest can save himself from that, and only if he chooses to. We’re back to that core question: Is he going to do it? Reply hazy, try again. Forrest’s reviews: killing a person, veto; living life by the Magic 8-Ball, one star; procrastination, veto; killing a person (theoretically, he’s assuming), half a star. “Can I just say? Sometimes you’re a little rigid on the rules.” A.J.’s right, and if Forrest took just a few minutes to consider his position, he could rate procrastination with a clear conscience. Procrastinating on making a decision, even one about procrastination, is procrastination. I can’t be the only one who quailed when Forrest, determined to kill, met with his father. Shin-biting appears to be Forrest’s go-to move. 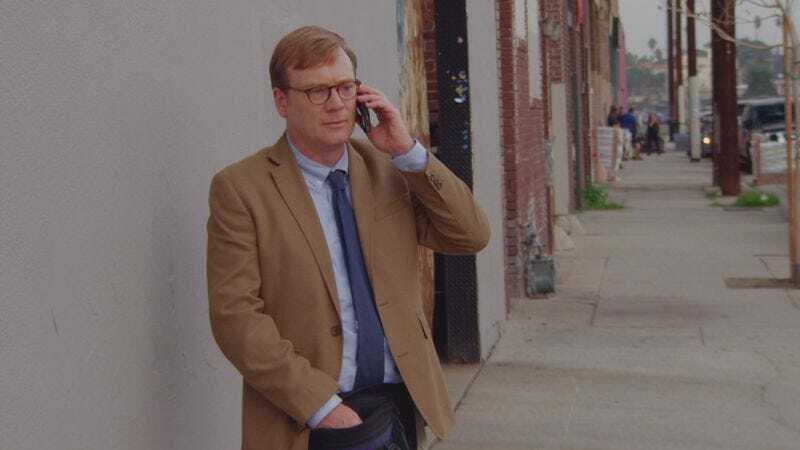 With two episodes left in the season, does Review hold further torments for Forrest MacNeil? All signs point to yes.